If your opponent controls more monsters than you do, you can Normal Summon this card without Tributing. 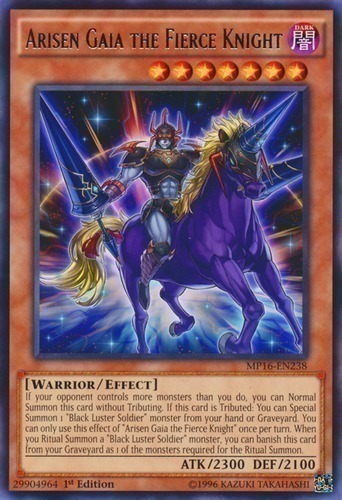 If this card is Tributed: You can Special Summon 1 "Black Luster Soldier" monster from your hand or Graveyard. You can only use this effect of "Arisen Gaia the Fierce Knight" once per turn. When you Ritual Summon a "Black Luster Soldier" monster, you can banish this card from your Graveyard as 1 of the monsters required for the Ritual Summon.